The BolderBOULDER 10k, run each Memorial Day in Boulder, Colo., is a bucket-list race no matter where you live. I ran it this year, my first BB10k since 2007, and was happy I made the trip. You can usually find relatively cheap flights to Denver, and if you don’t have friends to stay with, there are plenty of Airbnb properties in surrounding communities like Lafayette or Louisville, where my family stayed. The race itself is a huge event. More than 46,000 finishers crossed the line in 2018, but it remains expertly organized and accessible. Participants, upon registering, are given the option of submitting a finish time to be seeded, joining an unseeded wave, or walking. The qualifying times for 2018 meant that my 10k time of 51:12, put me in the DA wave. Also in the race with me were my husband in the A wave, and my husband’s sister and father in the NG wave. By the end of the day, the yard at the end of the slip n’ slide was a mucky mess! Despite hosting tens of thousands of participants, BolderBOULDER has a super-efficient bag check. Piggy-backing on the University of Colorado’s football game bag rules, all bags must be clear and be no larger than 12 by 12 by 6 inches. I brought my gear in a clear gallon Ziploc bag, which I then put in one of their clear bags because my bag was bursting at the seams. Bag check does come with a $5 charge, but I paid during registration, and just handed the volunteer my voucher. Then he peeled off one of two matching stickers and put it on my bag, giving me the other one. Bags are put in sequential order into boxes which are then loaded onto Budget rental trucks. When a truck is full, it drives to the finish line and parks outside the stadium. Genius. The wave start at the BolderBOULDER is probably my favorite thing about this race, from a logistical perspective. The waves are organized so that as you approach the start area, volunteers hold up signs reading, “AA Wave” or “BA Wave” and so on. A map on the race website gives you an idea where your wave will be prior to the A Wave start, so you have a good idea where to head, but if you’re in the potty line or running late, you can generally head towards the actual start. This happened to me and a new friend I made in the bag check line — we had to duck out of the potty line to make our waves, and I had to work my way from the E wave to DA, which I did just as the final C wave (CC) took off. Each wave is separated by a line of volunteers holding a rope. As their wave approaches the start, they keep anyone from starting early and then zip out of the way once the previous wave is clear. Another line of volunteers, who give everyone a high-five, check bib numbers to make sure that you’re starting in your wave or a wave that would start after you (for example, if you were in wave EB, you could start with EC, but not with EA). As the race is chip timed, a number of people ended up doing this, without sacrificing any time. As I mentioned, I opted to make my wave start on time, skipping a potty break to do so. But just a quarter-mile into the race, I spotted some potties with no line and took care of that problem quickly. Speaking of potties … the BolderBoulder must have to order up porta-potties from Denver and maybe even other cities to have as many as they do. Lines of potties are near all of the wave corrals and at frequent intervals along the race course. And the finish is at Folsom Field (the University of Colorado’s football stadium), which is well-equipped in terms of restrooms. The first mile passes pretty quickly, without the stress of most races where you may have to weave in and out of other participants. The DA wave seemed to have a start field of about 150 people, but we were all theoretically around the same pace, so there wasn’t any crowding. The start also spans the entire width of a 5-lane street, with plenty of space. 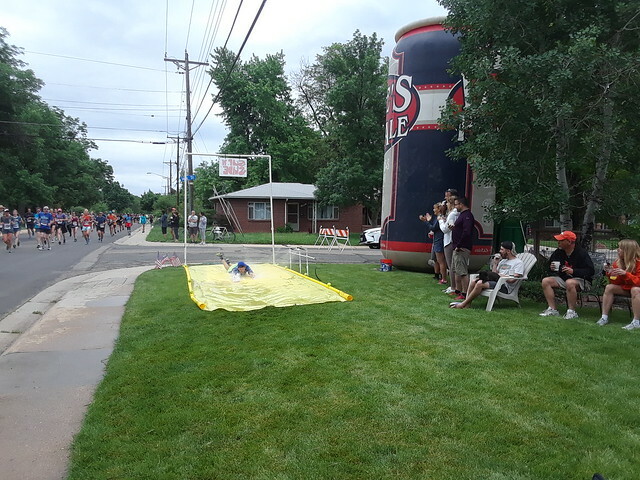 Despite being at elevation, the BolderBOULDER course is pretty flat. There is a hill around mile 3 that I noticed, but that was really the only hill that slowed me down until the hill into the stadium. By that point, though, you’re so close to the finish that it’s a little easier to power through. What is really remarkable about the course, though, is what happens on the sidelines. 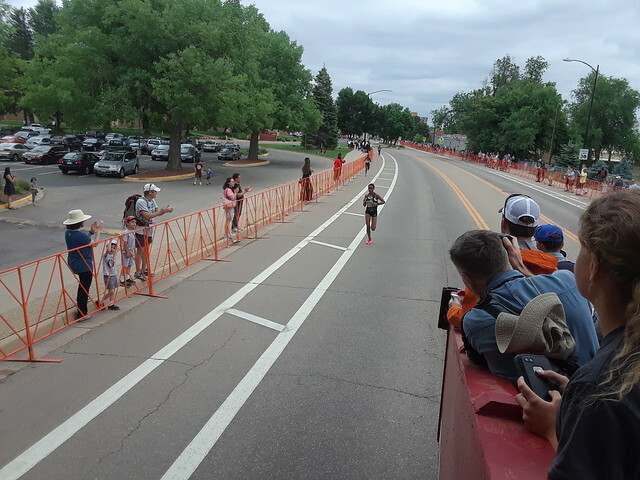 There were a ton of fun people cheering on BolderBOULDER participants. The actual race aid stations deserve credit, as well. 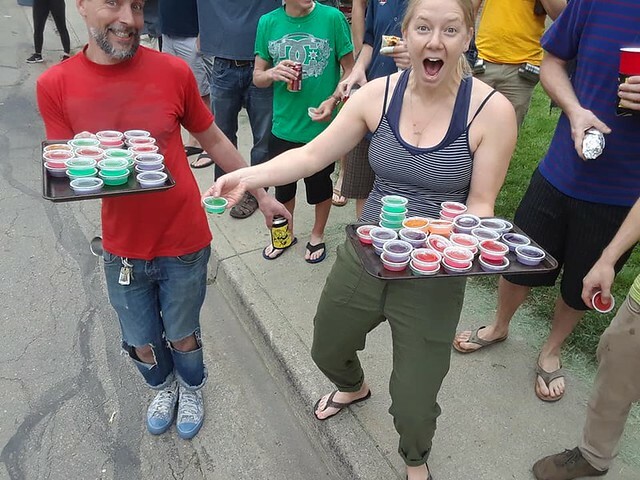 A solid line of at least 40 volunteers stood on a painted white line, offering energy drink and water, with a back-up crew keeping their tables filled. Another 20 or so volunteers marshaled errant cups with rakes, and they all cheered as people passed by. The race finish approaches quickly – the stadium is built partially into a hill, so it doesn’t tower over neighboring structures. I only realized how close we were when I checked my watch and saw I’d already covered 5.8 miles. Then, up a short but tough hill, a left turn into the tunnel, and then onto the field we ran (the field was covered in a solid decking structure). When I finished, the stadium didn’t look that full, but 13,182 runners had already finished ahead of me. That’s what happens when a race finishes in a Division I football stadium! The final turn is filmed with a closed-circuit TV that beams the view onto the stadium’s big screens. It’s really cool to see yourself running along, and helps friends or family in the stands find you in the crowd. Then you run through a huge arch and have plenty of room to walk it off before going to get your goodies. Both Balch Fieldhouse and the stadium’s concourse are set up to receive runners and distribute goodies. Everyone received (if they wanted to) a BolderBOULDER lunch bag which contained non-perishable snacks and coupons, including a $30 Hello Fresh card and a sweet Chik-Fil-A discount card. The next giveaway was an icy cold Activia yogurt drink, followed by an Oskar Blues Pinner Throwback IPA and/or bottles of water (I took one of each). After that, you could head back to the stadium to watch other runners, head outside to soak up some sun, or if you were so inclined, head home. Some runners, like my husband, ran the short distance back to the start and ran with friends or family; I got to ride on the press truck for the women’s elite race. If you ever get the chance to ride on the lead vehicle for a race, take it. I rode on the press truck along with photographers and journalists, coaches (who are not permitted to coach during the race), and officials. A pair of runners I’d met during the race were able to get on the truck – they were wearing PRC jerseys so of course I had to strike up a conversation – and were close friends of one of the U.S. runners. The press truck is essentially risers on a trailer, with a wooden frame for you to hold onto when turning. You’re standing the entire time (although it seemed to go by much faster than I thought it would) and when you go over a bump, it’s nice to have something to grab! Officials on the truck would point one way or the other to alert the leaders of an upcoming turn, and it was obvious which runners knew the course well because they were running the tangents from every corner. We’d occasionally get a warning … “Bump!” but the ride was pretty smooth. I’d been warned that as we approached the finish, we’d accelerate to get ahead of the leaders, fly up the hill to the tunnel, and have to run from the truck for the chance to beat the winner to the finish line. Of course, they had about 400 meters to go while we had less than 200, but those ladies are fast. 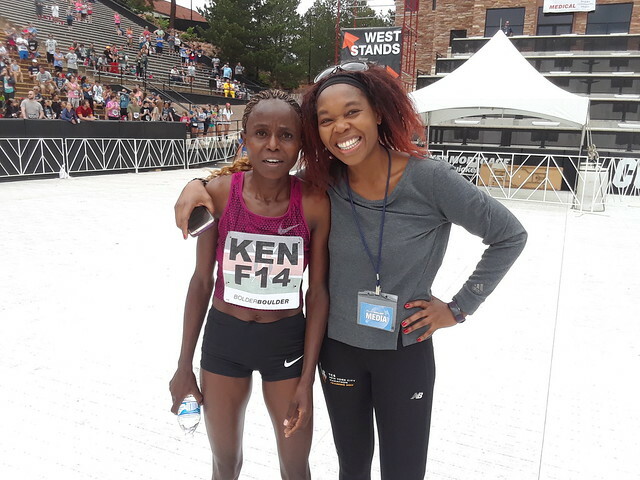 Mamitu Molisa of Ethiopia won the women’s 10k elite race in 32:37, with Aliphene Tuliamuk of the U.S. finishing 2nd at 32:48. Despite how much fun it is to watch the race unfold along the route, it’s pretty fun watching the finish from the stadium as well … the roar when the athletes exit the tunnel is thunderously loud, and it’s a moment that can give you chills. The BolderBOULDER is the perfect marriage of community running and elite competition. 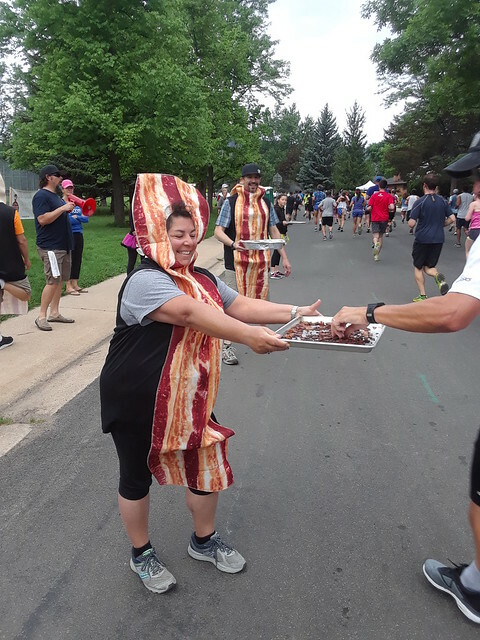 And that, even with the on-course bacon and beer, the retro-style ringer race shirt, and expertly organized start, course, and finish, is what sets this race apart. It’s a celebration of all runners, all walkers, and the community we’ve created in every town and city across the world. Margaret Muriuki with a New York Road Runners Club official at the finish. Muriuki ran 33:14 and finished 5th. Registration is open for the 2019 BolderBOULDER, which will be on May 27, 2019 (Monday – Memorial Day). Registration starts at $50 for adults and $35 for those age 14 and under.